Dubai is a man-made wonder on earth. Once known for its rich oil reserves, Dubai is now re-positioning itself as a hub for global travellers and an important tourist destination. Burj Khalifa- at present world’s tallest building, about 830 meters high. Burj Khalifa is open to visitors everyday between 8.30 Am to 1 am. Your visit to Dubai is incomplete without a selfie infront of Burj. However reports indicate that Saudi Arabia is planning to build a tower taller than Burj Khalifa which should be operational by end of 2017. I am sure Dubai will then build another building taller than the tallest building, to reclaim the top spot. Do you know that you can try skydiving from Burj Kahlifa? Atlantis Hotel- This super luxurious hotel was shown beautifully in the movie “Happy New Year”. Most expensive suits in this hotel go for about USD 60000 a night (About 40 lakh rupees per night). If you can’t afford to stay there, at least you can take a close look. Do not miss the grandeur of this building. Palm Island- close to Atlantis, this man made wonder is best seen from top. Artificial island built on land reclaimed from sea, Palm island is where who’s who of Dubai have their beach homes. Of course there are lots of attractions for tourists too. 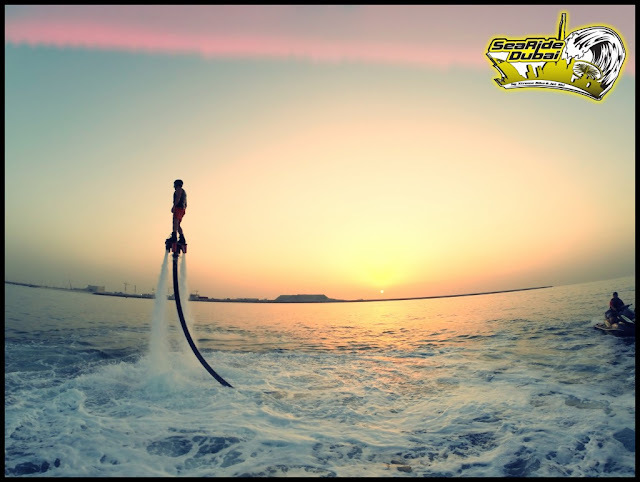 Flyboarding- Ever tried this watersports? Jetski ride, parasailing, kayaking etc are for the ordinary people. Flyboarding is the new adventure you can try in Dubai (probably only in Dubai). Flyboard is the new extreme watersports in which you can feel like flying around in water, about 10 meters or so above surface, powered by jetski turbines. SkiDubai- Dubai is a hot country. You think you can’t experience snow? You are wrong. Skidubai offers artificially made environment where you can experience super cool ice sports including skying. So why go to far away mountains when it is right inside your city? Desert Safari: Hop on super luxurious and super capable land cruisers to experience Sand dunes of Dubai. Try off-roading bashing some sand, try belly dances. Desert Safari is a mandatory item in your Dubai visit. Shopping: No visit to Dubai is complete unless you shop till you drop. Best of items from around the world are on sale in Dubai at reasonable rates. Most of the time there will be lucky draws and if you are lucky you might win something very big- like a Maybach car. These are just a few of several attractions in Dubai. Now that you’ve decided to visit, we need to worry about the Visa part. Though UAE doesn’t give visa on arrival to Indians, applying for Dubai Visa is pretty simple process. You can check this earlier post of mine for Dubai Visa details and things to keep in mind.